Given one “TV table” for ESPN at the 2005 World Series of Poker (WSOP), who would you choose to play on that table: “Table A” with Mike “The Mouth” Matusow and nine unknown amateurs, or “Table B” with Hall-of-Famers Phil Ivey and John Juanda, alongside great players Can Hua and Farzad “Freddy” Bonyadi? Not surprisingly, ESPN chose the mouth and the nine amateurs. Poker is about entertainment these days, and whether Matusow ever reaches the Hall of Fame, he is certainly entertaining to watch. You never know whether he will laugh or break down and cry, needle someone else, do the now famous “Matusow blow up” (giving away all of his chips in one fell swoop after days of great play), or get in a verbal fight with another player, resulting in a 10-minute penalty for him and the other player. Despite Mike’s eccentricities, let’s not forget his good heart. Not to mention that he was the only great player to make the final table, finishing ninth in a field of 5,600 players. And although “Table B” would have shown much more advanced poker play, that doesn’t guarantee it would have been exciting to watch on television. Much like professional wrestling, excitement and personality are appealing elements in poker. During his 2005 WSOP run, Matusow noticed a key tell on a fairly new brick-and-mortar player named Dustin Woolf. Although Woolf is relatively new to the brick-and-mortar game, he is a legend in the Internet poker world. Ironically, Woolf’s name at UltimateBet.com is “Neverwin,” but believe me when I tell you that Neverwin has won millions of dollars playing online poker. Still, the difference between playing online poker and playing brick-and-mortar poker, face to face, is like night and day. One key difference is that you do not have to disguise yourself online and worry about tells. After all, when you are in your den, it’s just you and your computer with no one to look you in the eye when you’re attempting a bluff. Thus, when Woolf had a strong hand in a real poker room he always threw his chips into the pot in a splashing sort of way. Imagine a stack of chips falling over when an opponent flings them into the pot. But when Woolf had a weak hand, he always said, “I raise,” and then carefully placed the chips into the pot. Matusow picked up on this tell and was ready to take advantage when the time was right. The flop was a good one for Matusow, giving him and open-ended straight draw with a board of K-10-4. Now Woolf bet out $250,000, saying, “I bet,” and setting the chips into the pot carefully. 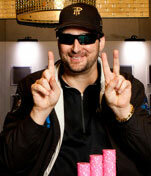 Matusow, though, decided to let Woolf bluff one more time (on the next round of betting) and just called the bet. With a six on the turn, Woolf checked, and now Matusow said, “I’m all-in.” Woolf folded his hand lightning fast, and Matusow put the extra $330,000 into his stack.